By 1856 not only had the Pine Street store become too small for its impressive trade but the commercial district was moving uptown. Arnold & Contable commissioned a grand new emporium on Canal Street at the corner of Mercer. The façade was clad in white marble, giving it the familiar name “Marble House.” Five stories tall, it was elegantly designed with corner quoins; arched, carved window lentils and a flat roof with a modest cornice. The Mercer Street side mimicked in red brick the design of the Canal Street façade. Later, in August of that year, The New York Times commented on the “beautiful assortment of evening silks. Some of white taffeta, with a shower of tiny golden stars, were very striking. A new silk, and one which will be very much worn, is the striped watered silk,” it said. Indeed, the well-heeled ladies of New York could purchase the latest fashions of Paris in Arnold & Constable’s white marble emporium. “We do this for the reason that we know no Southern merchant will expend the money that he has obtained from Southern slaveholders in building up and enriching a class of men who are stabbing at the vitals of this section,” the paper said. The boycott did little harm to business and in 1862 a perfectly-matching addition was added to the east. In May 1869, while Arnold, Constable & Co.’s immense second store was rising uptown on Broadway at 19th Street, three men walked into the Canal Street store at 11:00 am and boldly walked out with an entire display case. The case, filled with $500 worth of goods, was loaded onto a butcher cart waiting at the curb and the thieves casually drove away. The firm kept Marble House long after the grand opening of the magnificent Broadway store. While the great emporiums like Lord & Taylor were focusinging their retail efforts around Union Square or 6th Avenue, Arnold, Constable & Co. kept the Canal Street store open as an option for its shoppers. As late as 1878 Goulding’s New York City Directory listed both addresses for Constable Dry Goods. Almost everything in New York City is cyclical, however, and in 2005 when the United American Land Company purchased the building, it began considering the possibilities of the former Marble House. PKSK Architects were brought in to convert the Canal Street entrance to a retail space and to convert the upper floors to rental apartments. 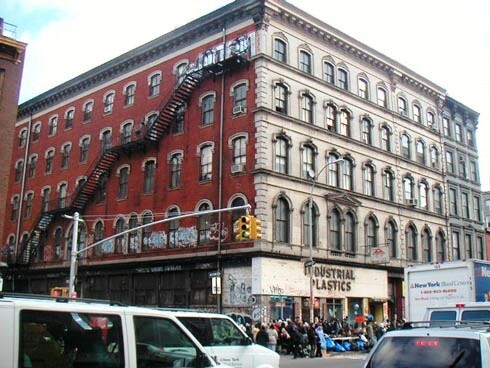 The unsightly fire escape was removed and the glazed storefronts and arched bases were restored. The project was completed in 2008. Indeed, the blocks along Canal Street near the old Arnold, Constable & Co. building are undergoing a renaissance. Ornate cast iron and masonry buildings are re-emerging from under decades of soot, metal and plastic signs, and fake facades. A bank is now housed in the street-level space where Mary Todd Lincoln once shopped.